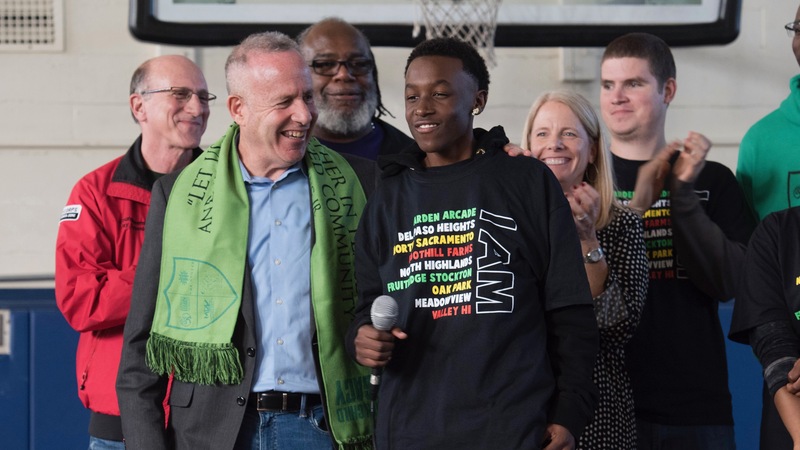 As Sacramentans gathered to celebrate the civil rights legacy of Martin Luther King, Jr., Mayor Darrell Steinberg announced Monday that he would make a mid-year City budget request of $350,000 to create Teen Tech Hubs and Teen Hubs, events designed to provide fun, educational activities for teens at about 10 locations around Sacramento every Friday night. Comcast announced that it will invest $300,000 in Sacramento youth: A $100,000 contribution will be for the Teen Hubs and $200,000 will go to create the Teen Tech Hubs in partnership with community-based organizations that will offer meaningful, interactive technology experiences and trainings for teens. He said the City and Comcast would work with the Sierra Health Foundation and community-based organizations to program the events. Gauder said Comcast will focus its contribution on digital literacy training that includes coding and programming and becomes progressively more advanced, ending in a prize when the program is completed. Mayor Steinberg is looking to build on the success of the Youth Pop Up events held earlier this month with a $30,000 grant from the Sierra Health Foundation. With just a few days’ notice, community organizations staged 14 events around the city that drew an estimated 1,400 young people on the weekend of Jan. 4-6. Activities offered included roller skating, basketball, a mobile barber shop/beautician, DJs, a photo booth, movies, ping pong, and a talent show. If Mayor Steinberg’s funding request is granted by the Sacramento City Council, the money will be combined with the funding from Comcast to offer free weekend Tech Hubs and Teen Hubs across Sacramento neighborhoods through June, at which point Mayor Steinberg said he hopes to have secured more permanent funding in the City’s annual budget. “These weekend events should be the norm, not the exception to the rule,” Mayor Steinberg said. The planned Friday night gatherings build on the rich history of urban “midnight basketball” and the City’s current neighborhood-based “Hot Spots,” which are held in one or two locations each weekend. The sites will be distributed geographically and, to the extent possible, close to public transit to ensure that as many teens as possible, especially those in the most underserved communities, have access to positive alternatives. “We hope this community-wide partnership demonstrates to our youth what we know: that their success and health is essential to the success and health of their families, our communities and our city as a whole,” Hewitt added.